WORDS IN OUR BEAK, VOLUME ONE is now available in a hardcover print edition from Ingram Book Group. (www.ingramcontent.com/retailers/ordering). The story is a narrative told from the perspective of a friendly and astute female cardinal named Cam, who gives readers her perspective on how birds see humans while also informing readers about the joys and hardships of life in her winged world. For anyone even mildly interested in birds, this is a delightfully imaginative and heartwarming introduction to the feathered friends in our midst. 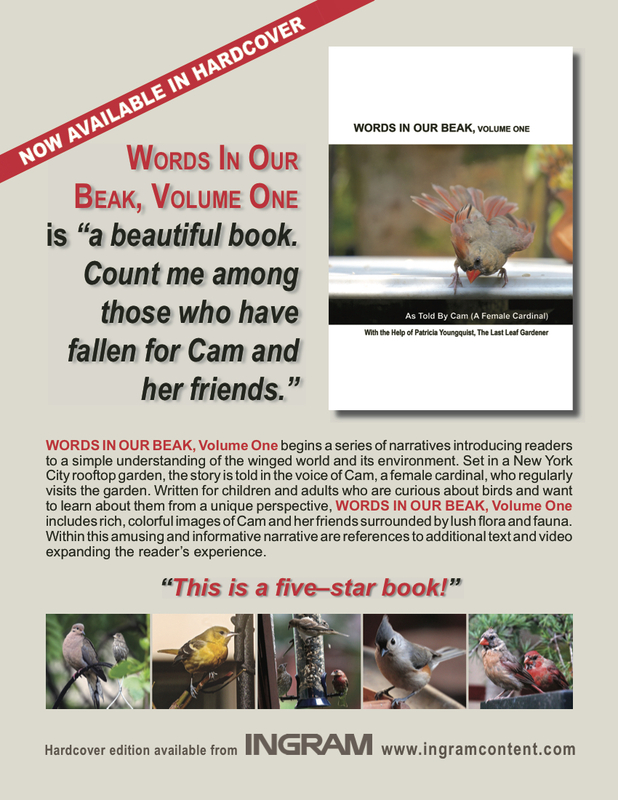 Cam spends much of her time in the author’s roof–top terrace garden in Manhattan, entertaining readers — children and adults alike — with her witty observations about urban life in this fun and fact–filled work. We get a “bird’s eye view” of New York City scenery, and what it’s like for Cam and her friends to search for food, cope with heavy rain, and take care of their families and each other. Cam has much compassion for others (even competitors for food), like mourning doves, because, as she explains, they can more easily lose toes in freezing cold. She loves “people-ing” (observing humans), “flora-ing” (admiring urban gardens), and eating black–oil sunflower seeds. The author — who Cam calls “TLLG” after Ms. Youngquist’s award–winning blog, The Last Leaf Gardener — includes over 300 stunning color photos and references to several short, garden–themed videos which she produced that will expand reader experience and knowledge. This hardcover edition is complemented by the softcover version published by MagCloud, a division of Blurb, Inc., and as an e–pub available through both Amazon Kindle and Apple iTunes. Sample pages are available for viewing. Patricia Youngquist, The Last Leaf Gardener, is a visual artist and writer whose work seamlessly moves between the disciplines of photography, blogging, and videography. Starting with her emotionally impressionistic black–and– white photography that evolved into her colorful prismatic kaleidoscopics created with a pinhole camera of her own design, Patricia’s photography now focuses on the lushly realistic flora and fauna of her urban garden and sharp, intimate close ups of the birds and insects who visit it. As a blogger, Patricia uses simple and accessible verbiage to paint vividly descriptive mental images, a skill that is translated into her lyrical videos which celebrate moments in time. For more information, please go to www.patriciayoungquist.com or www.thelastleafgardener.com or follow The Last Leaf Gardener on Facebook: facebook.com/TheLastLeafGardener/. 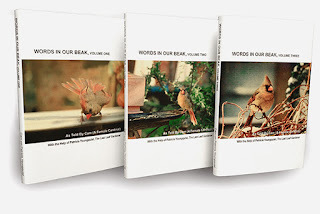 If anyone so inclined, Cam and I would truly appreciate it being forwarded to those who might be interested in this version of "Words In Our Beak Volume One."